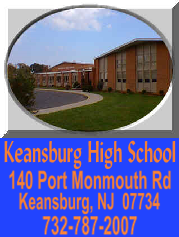 The 2017 version of Keansburg wrestling features a healthy mix of youth and experience. The improving feeder program injected a good shot into the upperweights last year, and now there is influx coming into the lowerweights this season. The lineup's strength could be in the upperweights. Sophomore Paul Liseno is one of the good, young big men in the Shore, and is coming off an impressive rookie season that saw in rack up 19 wins at heavyweight in 2016. He has to the potential to have a big breakthrough year with that season of experience to his credit. Another upperweight coming off a strong freshman season is Liam Riecks at 195, who picked up 13 wins wrestling against mostly upperclassmen a year ago. Seniors Will Lambert and Dave Clayton, a starter for the Titans as a frosh in 2014, round out what could be a solid group of uppers. There's a lot of experience returning in the stretch from 126-145, as well. Senior 132-pounder Kevin Rogers is the returning wins leader, and gives the Burg a nice veteran presence here. Danilo Ferrer, Hector Triana, Patrick Edwards, Dackota Read, and Basit Khan are returning letter winners looking to take the next step in 2017, and senior Vanessa Wilson, a 13-match winner in 2015, also returns to the fold, giving coach Chris DeTalvo a tested group with some depth. Expect to see some new faces in the 106-120 weight classes. Sophomore Josh Celia is the only experienced returner, but there's a promising group of frosh looking to step up and contribute, including Gavyn Read at 106. Again, there's a pretty nice mix of experience and youth here. Obviously the Titans aren't ready to take on the giants of the Shore, but they'll hold their own and pick up their wins against the programs of similar sizes and look to be competitive in the B-Central hunt.